The Britten Sinfonia's jazz-themed programme, which debuted at the London Jazz Festival earlier this week, made an appearance a Saffron Hall in Saffron Walden on Saturday 21 November 2105 which gave us the opportunity to visit this relatively new cultural destination for the first time, and it was recently announced the the Britten Sinfonia will be resident at the hall from next year. 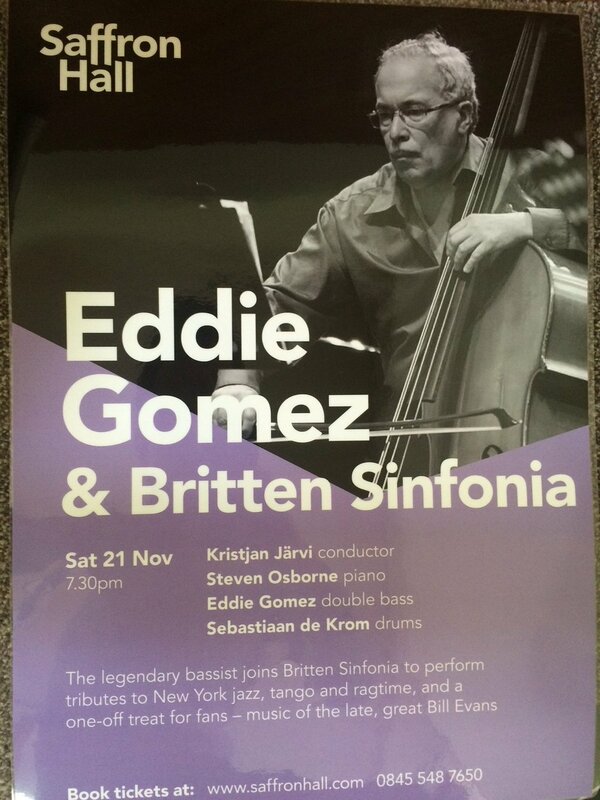 The Britten Sinfonia was joined by legendary double bass player Eddie Gomez, who has performed with the Bill Evans Trio and with luminaries such as Miles Davis, pianist Steven Osborne (best known for his classical repertoire from Beethoven to Britten but here showing his engagement with jazz and improvisation), drummer Sebastiaan de Krom and conductor Kristjan Järvi. The programme included Stravinsky's Tango and Ragtime, Frank Zappa's Igor's Boogie and The Perfect Stranger, excerpts from Claus Ogerman's Symbiosis, Darius Milhaud's La creation du monde, and Simon Bainbridge's Counterpoints (which received its world premiere earlier this week). 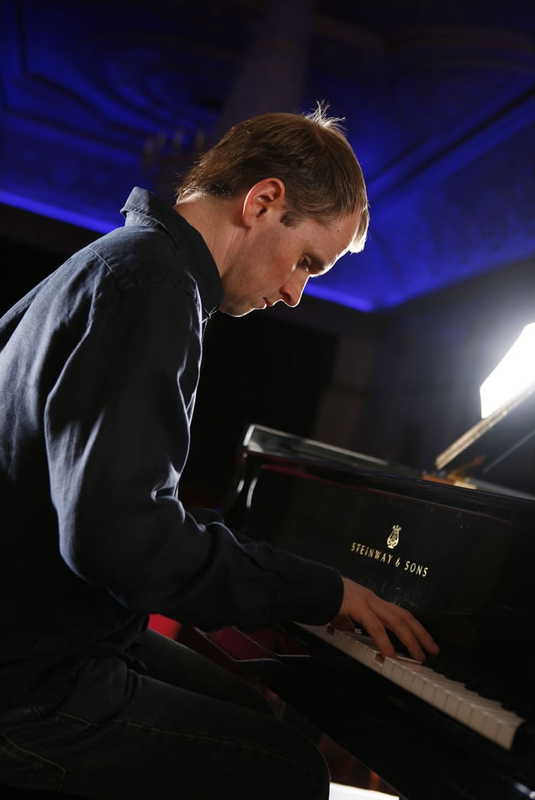 We started with Igor Stravinsky's crisp and stylised piano solo Tango, played by Steven Osborne, one of the first pieces Stravinsky wrote in the USA after emigrating in 1940. This was very much Stravinsky's own distinctive take on the tango genre. Steven Osborne followed it with a darkly dramatic solo improvisation, more free jazz than Stravinsky. Frank Zappa's tiny Igor's Boogie came next, in an arrangement for chamber ensemble by Philip Cashian. Invigorating and brightly vivid, the piece created very much its own intriguing sound world. Stravinsky's Ragtime for 11 instruments was performed without a conductor, with violinist Jacqueline Shave directing from the leader's desk. The work grew out of the more popular-style ragtime sections of The Soldier's Tale. 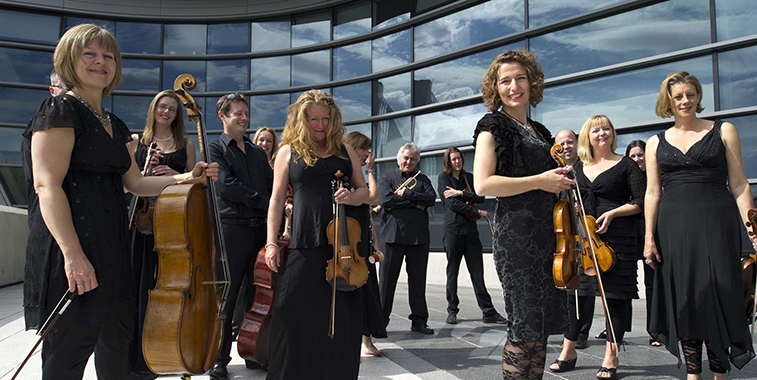 The work's distinctive sound world comes from Stravinsky's use of a cimbalom as continuo instrument. Here the performers gave a pin sharp rhythms and tight focus, to create a fabulous performance. It was intriguing to hear the way Stravinsky took familiar ragtime rhythms and moved them into strange and interesting places. The first half concluded with a return to Frank Zappa for one of his most substantial works, The Perfect Stranger. But though written for orchestra, Zappa uses the instruments in his own distinctive way and the players were arranged in lines with instruments mixed up, gathering those of similar pitch together and arranged symmetrically. Zappa's concert music was written in parallel with his work with his group The Mother's of Invention. As a self trained composer he brought his own ear to the music of The Perfect Stranger. The sound world and orchestral textures rather recalled composers like Messiaen and perhaps Varese, a very free, fluid feel. This was a work all about texture and rhythm, and Zappa seemed to write using a complex web of sound from his various instruments. It was an intriguing piece but I certainly did not get Zappa's programme of a door-to-door salesman cavorting licentiously with a slovenly housewife. By this point in the concert, a weakness of the programme was becoming apparent. Each of the items, some very short, seemed to require a significantly different ensemble and the gaps for set-up between the works were almost as long as the shorter pieces. One of my companions enjoyed the spectacle whilst the other thought that a choreographer should have been brought in, or perhaps Steven Osborne encouraged to improvise music as accompaniment! 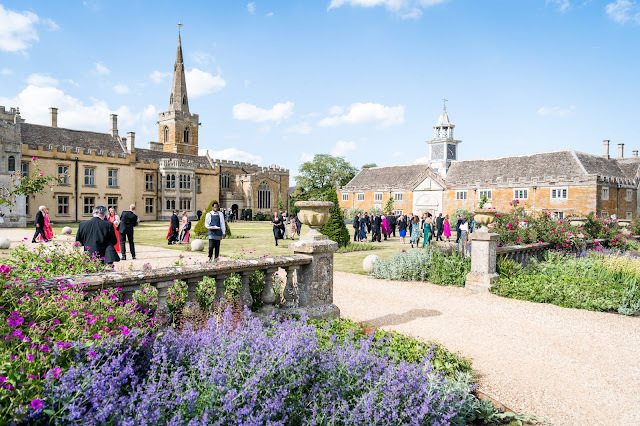 During the interval we had a chance to wander round Saffron Hall. Opened in 2013, it is at Saffron Walden High School and thanks to the generosity of the Yellow Car Trust is shared between the school and a commercial arts programme (with extensive learning, outreach and participation). The hall itself is finely designed. The interior is full of gleaming wood and clearly highly flexible, with the possibility of a pit, curtains and lighting for use as a stage, yet the main block of seating retracts to create a sports type arena too. The acoustic is nicely sympathetic, not too dry yet not overly resonant. The access routes are fully adequate to the hall's needs (not always the case) with plenty of foyer and bar space. Part two opened with something of a curiosity, excerpts from part two of Claus Ogerman's Symbiosis. Born in 1930, Ogermn has worked as composer/arranger/conductor with the likes of Frank Sinatra and Billy Holliday. Symbiosis was a collaboration in 1974 with the Bill Evans Trio combining the trio with symphony orchestra conducted by Ogerman performing his own music. 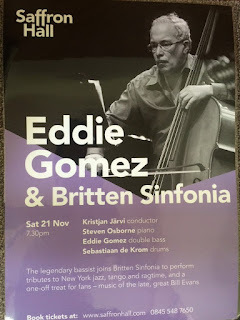 Eddie Gomez was the original bass player in the trio at the work's first performance and her he was joined by Steven Osborne and Sebastiaan de Krom, with strings, flute and clarinet from the Britten Sinfonia. 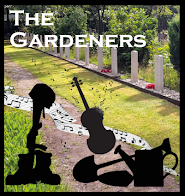 It started with just a piano solo leading to a dialogue between piano and strings, full of lush harmonies and an easy listening jazz style. When bass and drums came in they moved the music up a notch, it remained very much the laid back cocktail bar type experience. There was little sense of jazz and classical music being stretched in any way. There was, however, a stunning pizzicato cadenza from Eddie Gomez. Darius Milhaud's La creation du monde was more of a known quantity. Here given quite a pacey performance by Kristjan Järvi with the saxophone slightly less spotlit than usual. Throughout the performance I was struck by characterful detail, and the way the balance between instruments was sometimes unexpected. And no matter how languid the overall textures, the rhythms underneath were wonderfully snappy, thus creating something complex, multi-layered and often quite transparent. That said, I am not sure whether the performance really made its full mark as a whole piece. And I did wonder whether the flip-flop between styles throughout the performance was entirely beneficial. This, combined with the gaps, seemed to mean that the programme never quite added up to more than the sum of its pars. Would we have appreciated the Milhaud more if the first half of the concert had moved seamlessly from the two Stravinsky pieces, through the Milhaud to the two Zappa pieces? I wonder? 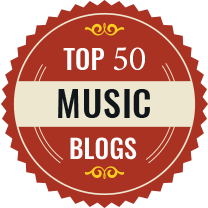 Simon Bainbridge's new piece, Counterpoints, is very much Third Stream, a meeting of classical and jazz which really pushes boundaries (in the way that Ogerman's piece did not). Written as a concerto for Eddie Gomez, Gomez started off using his bow for some eerie harmonics in the introduction but thereafter stuck to pizzicato (and pretty spectacular it was too). 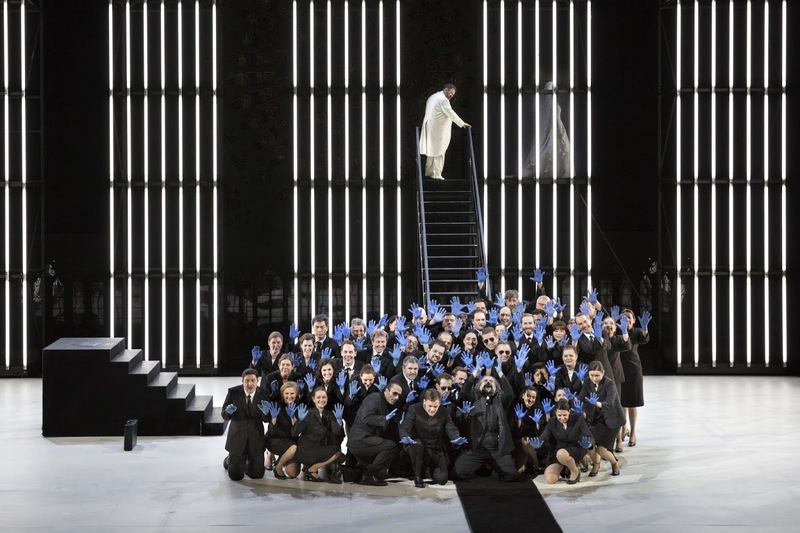 The work started with Gomez in a series of dialogues with different instruments, developing into dialogues with the full orchestra. The bass part seemed to be pure jazz (Eddie Gomez played from a stupendously sized part which contained a three stave reduction of the orchestral part to give him the information over which he could improvise). But the orchestral writing certainly pushed the envelope and in the later sections of the piece Bainbridge created complex webs of sound which backed or punctuated the bass solo. The double bass remained moderately quiet and never quite dominated. At 18 minutes in length, towards the end I was rather longing for all hell to break loose but it never did. The work is certainly intriguing, but I did wonder what would happen to it in a performance which used a different double bass player; is it completely tied to Eddie Gomez's style and technique? The works in the programme each shared a different, complex interaction with jazz and individually there were some fine performances. But, perhaps for the reasons outlined above, the whole programme never quite gelled and seemed something which worked better on paper (or perhaps on CD! ).